It’s hard to believe that my first novel with Forever Yours came out one year ago today! 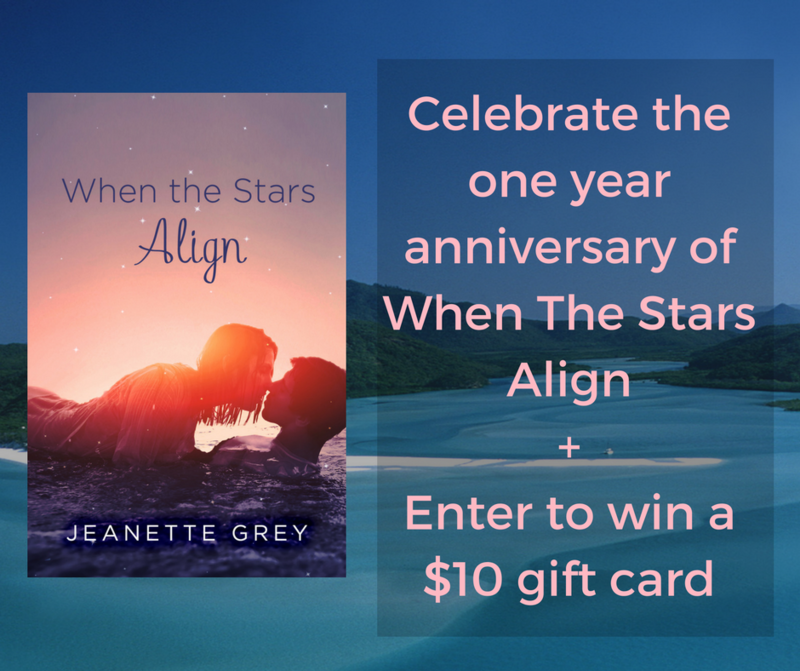 When The Stars Align is a steamy, tropical romance, featuring star-gazing, dips in the ocean, a blue-haired, tattooed heroine, and a hero who’s both a hottie and a brain. To celebrate the anniversary, I’m giving away a $10 gift card to the winner’s choice of either Amazon or Barnes & Noble. To enter, go read the first chapter of the book FREE , then email me at jeanette@jeanettegrey.com with the names of Adam’s two housemates and add your email to the Rafflecopter below. You can also earn bonus entries for tweeting about the giveaway or visiting my page on Facebook or Twitter. Thanks so much for entering, and for making this year a great one! This giveaway is now closed. Thanks to everyone who entered, and congrats to the winner, Alice!